I made this a while ago when I was not feeling well, as I wanted something warm and a bit spicy. I loved the complex flavors, the subtle spice, and the amazing flavor all the ingredients added! I used a recipe from Williams Sonoma for White Turkey Chili, but changed a lot of the recipe, so here it is. I wish I would have thought of adding some crispy corn stips...maybe next time! In a large dutch oven, heat the olive oil and fry the chicken until golden brown, about 3-4 minutes per side, remove and place on a plate. Add the diced onion, cumin, and garlic and saute until soft and just turning golden. Next add the anaheim chilies, jalapeno, and chicken stock, and scrape up all the browned bits from the bottom of the pan. Remove the skin from the chicken and discard. Add the chicken to the pot and simmer until just tender, about 30-40 minutes. Remove from pan and cool slightly, shred chicken, discarding any bones, and add meat back to the pot. Next add the beans, oregano, and cilantro, and flavor with salt and pepper to taste. Simmer on low for about 30 more minutes so all flavors meld together. Serve topped with jack cheese and sour cream. Mmm just the way I like it! The perfect soup when you aren't feeling well. I hope you are better now. 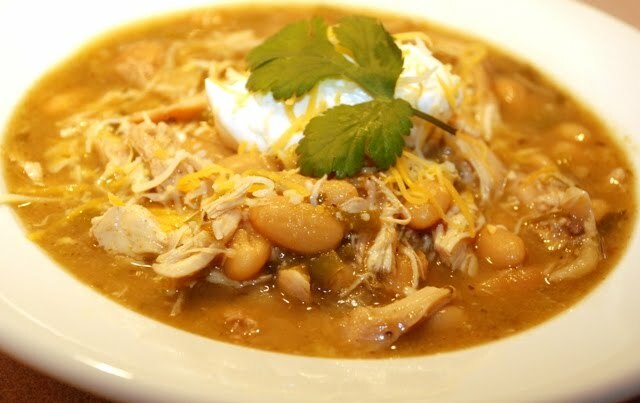 I bet you felt a whole lot better after a bowl of this yummy looking chili. Nice job, Jason. I love chili and your version sounds yummy! You're right, adding crispy corn strips would simply be divine. Remove from pan and cool slightly, shred chicken, discarding any bones, and add meat back to camisas personalizadas the pot. Next add the beans, oregano, and cilantro, and flavor with salt and pepper to taste.